NEPT booking software to ensure your NEPT department runs smoothly from booking to delivery, to back office functions such as cost recovery and reporting. Dispatchers can quickly assign bookings to vehicles simply by dragging the booking onto a vehicle. Swapping bookings between vehicles is just as easy. Summary information about bookings is instantly available by hovering the mouse over the booking. There is no need to open each individual booking. 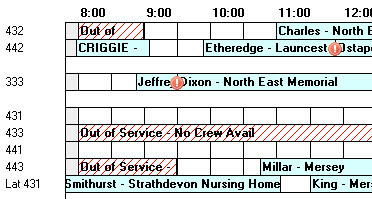 This provides the dispatchers with the critical information they need to easily assign bookings to vehicles. All vehicle pools can be displayed on the one form. By default, bookings are displayed as surname – destination, however, it is easy to change this to suit your preferences. Alerts can be configured by the system administrators. Alerts are triggered whenever a booking is requested, or altered. There are also late notice alerts. For dispatchers, clicking the alert will allow dispatchers to jump to the running sheet on the day of the booking ready to allocate the booking to a vehicle. For booking requesters, clicking an alert will open the booking. Alerts keep everyone informed and remove the surprises. Say googbye to telephone tennis. NEPT collects the vital information that is needed by dispatchers in order to allocate and prioritise the booking requests. This can be fully customised for your organisation. 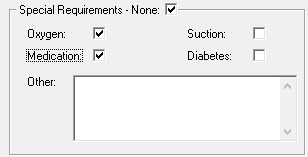 By default all fields are mandatory, requiring booking requesters to discount certain conditions. This process reduces the need for dispatchers to chase up information that booking requesters fail to complete, saving time and unnecessary delays. Depending upon your configuration choices, bookings can be requested by wards, clinics and even external agencies such as nursing homes. Recurring trips and return trips can be booked with ease. Past patient trips can be duplicated for super-fast entry. NEPT comes with multiple free support options. The comprehensive user manual includes an in-depth getting started section, a user guide, and a detailed field reference. There are also video tutorials. I.T. Guaranteed welcomes contact for support by email, phone or skype. Remote desktop support (Quick Support) is available directly from the menu bar.